The low-carb, high-fat (LCHF) dietary regime poses little difficulty for restaurants, unless starch is the key dish, which makes the diet bad news for bakeries, pizza palaces, sushi bars and burger joints. But sashimi over maki, burgers without buns, bread and pizza without wheat, and one-calorie rubbery shirataki noodles instead of pasta soon becomes exceedingly tiresome. One only has to look at the health food shelves to see that the search for substitutes is on in earnest. In recent months, I have been experimenting with dozens of alternative low-carb recipes. Baked cheesecake is a cinch with stevia. Carrot cake with a mix of coconut and almond flour and a teaspoon of xanthan gum comes out beautifully, but the use of xylitol instead of sugar sends one scurrying to the loo in minutes. The problem comes with dough. Nothing matches the real thing. Low-carb pasta never achieves any length and, after a good stab at it, I have now given up on the alternative recipes. Crêpes have to be bound together with so many eggs they begin to taste like bad quiche. Breads are improving but they are still best toasted, and nearly all of them leave one choked up with psyllium husks. You’re better off with flax crackers. Nothing comes close in smell or taste to a freshly baked loaf. The same can be said for LCHF pizza bases; they make soya sausages for vegetarians look good. Sadly, the Banting diet’s sole contribution to gastronomy appears to be the caulisotto. This is cauliflower put through a blender. It’s a kind of baby food no baby would touch. My first experience of this was at the Banting Kitchen in the Cape Royale Hotel in Green Point, though I notice it on menus all over town these days. The caulisotto here has shitake mushrooms, parmesan and truffle oil. It left me pining for rice. But I was surrounded by healthy-looking thin people, mostly women. The restaurant suffers from that bloodless hotel dining room feel. I tried the crustless goat’s cheese and baby marrow quiche with homemade tomato jam. It was simply quiche without pastry. The roasted butternut salad with herbed confit tomatoes, roasted walnuts and Danish-style feta, lots of rocket, and thinly sliced red onion was tasty enough, but keeping it low carb meant the butternut was ­scattered in little cubes the size of peanuts. Only a few doors down is 65 On Main, with a whole range of Banting meals “inspired by Tim Noakes and the paleo [palaeolithic] lifestyle”. On my first visit, I cringed as I listened to a mother and her adult son lecture the waiter on how awful the pizza base was: “This is not a pizza at all,” said the mum. “Your chef only needs to go and look on YouTube to see how to make a proper base,” chastised the son. “I’m taking this with me. I’m going to show people what you dare to serve here,” his irate mum puffed. I have no idea why the waiter fawned and apologised instead of pointing out to them it was intentionally a cauliflower pizza base. A good thing they didn’t ask for the pasta. In the bowl I ordered, the pasta came clumped together as a gelatinous mass buried in a sauce that appeared to be separating. Possibly the noodles hadn’t been drained properly. Banting noodles are hard to drain because they fall to pieces so easily. I had heard excellent reports about the eatery, but the day I ate there it was far from good. The owner, Whitney Wentzel, wasn’t around and that may have been the problem. The place was busy; the outdoor seating full. A procession of bunless burgers headed past me for a table of rather round patrons. People appeared to be enjoying their food. Here, too, there is cauli-risotto with mushrooms and basil cream. I opted instead for the aubergine, mozzarella, basil pesto cauli-wrap. It was nice enough, though rather plain, and to hold together the wrap is extremely thick. It was served with sweet potato chips (they’re allowed sometimes) and Banting mayonnaise (using coconut and olive oil, not vegetable). He went on to explain what one must watch out for in a bottle of pickles and described gluten as poisonous. Restaurants that cater for LCHF have enterprisingly taken the initiative to fulfil a growing demand. My advice, however, is, if you insist on being a Banter, then stick to your steak and forget the substitutes. 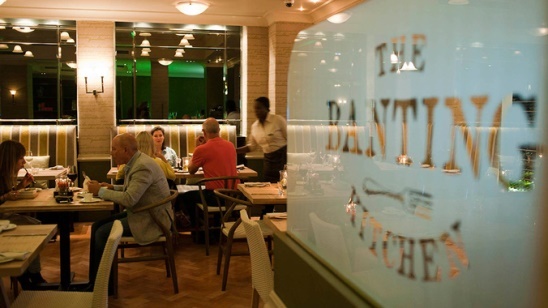 The Banting Kitchen, 47 Main Road, Green Point. Tel: 021 430 0506. This article first appeared in the Mail & Guardian on 7 November 2014.